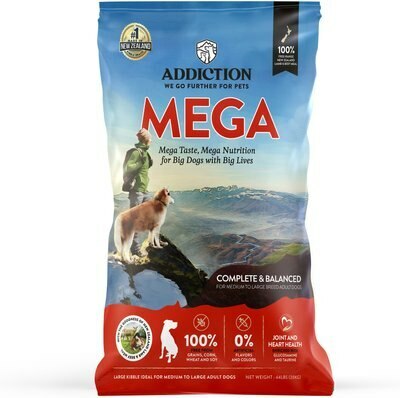 Addiction is a quality manufacturer of dog food. They go the extra mile to only use the finest ingredients. Your dog will enjoy this meat based dog food from the pastures of New Zealand. If you are trying to eliminate GMO’s in your dog’s diet, this company is one to look at for your kibble. Lamb, pork, and beef raised in New Zealand. Added glucosamine helps keep joints and hips in great shape so your dog gets the most out of life. Available in a 44 lb size rather than the 24 or 28 lb sizes that are so common with grain free formulas. This makes it a better choice for multiple dog households. Blend of fruits and vegetables add variety and balance to your dog’s diet. Minimal ingredient formula is easy to digest and is easy to transition your dog to even if they are normally very sensitive or have allergies. Like the previous Addiction dog food formula reviewed, this one has potatoes as the second ingredient and it is very cost prohibitive. The price is likely due to the shipping cost from New Zealand. As such, this food only for those that only have a single giant dog that requires special food. Addiction is a gentle and easy to digest dog food so all you need to do is replace your dog’s normal food with Addiction over seven days. Clean fresh water is important to have on hand at all times. Make sure water is available close to where you feed your dog. Puppies and pregnant or nursing mothers may need three times the amounts in the feeding guidelines. Dogs that are very active or seniors may need their daily feeding adjusted as well. The ingredients list is superb, excluding the addition of a lot of potatoes. Blueberries are always good to see in a dog food because of the amazing antioxidant protection they provide. Added glucosamine is something you should expect in any dog food for giant breeds, especially in this price range. Overall, Scoutknows recommends this dog food, though it might not be sustainable for those in North America. It takes a lot of fuel to get that bag all the way over here!